The Las Vegas of the North. A Mecca for bingo players the length and breadth of the nation. There are many descriptions of this section of the English coastline, but none come close to the actuality that is Blackpool. On the face of it, this Victorian seaside resort has everything. During the summer months, there is a mile of golden sandy beach, a fairground to rival the theme parks, more tourist attractions than the whole of America packed into three square miles. There are enough bed and breakfasts, hotels and self-catering accommodation to put up the entire social service collecting dole scrounging populace of the country, which appears to be, largely, what they contain. In the early winter months, there are the illuminations, a mile of light-bulbs depicting a wide variety of scenes. This has extended Blackpool's season into November, and remains, inexplicably, a major draw, considering that they appear to have not been updated since David Tennant was Doctor Who; given that one of the designs depicted in halogen is David Tenant's Doctor and Rose Tyler, pre-lip job. Assuming that the casual visitor can locate a hotel not full to bursting with social service residents, then Blackpool is truly a town that never sleeps. The place draws a wide variety of variety acts from top class comedians to world renowned singers. All of whom will only ever visit once. From venues on the piers to the Tower to purpose built theatres these world class stars can be seen in crumbling, poorly maintained structures, some of which require hard hats to be worn at all times. But they are there. Blackpool's other nightlife venues are the nightclubs and bars that litter the seafront, adorned with their own collection of street hawkers to drag in the passing Hen and Stag parties, only for them to be turned away at the door by the bouncers unless they look flush with cash or have skirts shorter than the attention span of the bouncer. There is a wide choice in terms of nightclub, from 80s theme to strobe adorned epilepsy inducing rave joints with every angle in between. What is missing, is a quiet pub for those that prefer their eardrums intact. The main drag, after dark, is not a place to wander aimlessly, due to the inhabitants that inhabit this Dali-esque nightmare, preying on Stags and Hens like a scene from a David Attenborough nature documentary. And yet, there is a feeling of joy amid the packs of revellers. They are enjoying themselves. Assuming it is possible to arise after a night on the town, and that memories and finances are intact after Rohypnol induced amnesia, then Blackpool during the day also has endless offerings to part tourists from their cash, which they do willingly and with no regrets. Starting at Pleasureland, there are roller coasters, rides and amusements to keep even a severe ADHD sufferer enraptured for an entire day. The Big One is aptly named, being a big roller coaster, whilst a ten second launch on the bungee ride is well worth a three hour queue, if only to leave the previous nights debauchery all over the inside of the capsule. To reload the stomach, there are places to eat aplenty. Be aware though, that the better places, such as the Daugnton Arms and Yates's (yes, really), are normally packed an hour or two before anybody eats, as visitors come in to grab a table, and will sit there until they are hungry. For those pleasure seekers who miss out on a table, there are alternatives, but these alternatives view salad in the same way that a parasitic biologist views ringworm: with distate but understanding it's necessity in the grand scheme of things. There are places where it is safe to eat, but if the cafe smells like the chip fat has not been replaced since Harold McMillan was in power, that's probably because it hasn't and it is best avoided. 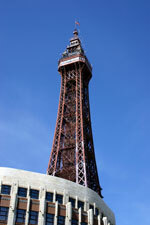 Food in Blackpool itself is basic food aimed at the people who visit the British Riviera. Chips. Better food is available away from main centre, for example, in Preston, but the weary traveller who has walked up and down the Golden Mile three times looking for a vacant table that has been cleaned this year, chips it is. And Blackpool is the spiritual home of the chip. A potato would die happy knowing it is to be cooked in Blackpool, for - to a caff - they will coddle it, caress it and then fry it to perfection. This is the advantage of never changing the fat, the chips are well cooked. And portions are of a size to make even the hungriest of visitors replete. During the summer months, the beach is very popular, with donkey rides, horseback rides, llama trekking and deckchairs for hire, so that sun worshippers can grab a tan amid the donkey, horse and llama droppings. The sea comes all the way to the promenade, so the best time to visit the beach is as the tide is on the way out. Certifiable maniacs can be seen on the beach in all weathers, and Blackpool gets all weathers. They can be spotted by their orange shorts and yellow vests, power-walking up the sand. It is said that surviving this power-walk grants immortality, looking at its proponents, this is true. For sociologists, psychologists or amateur people watchers, Blackpool is an essential stop on the road to enlightenment due to the human zoo nature of the sea front. There are the morbidly obese, the clinically obese, the turgidly obese and the just plain fat. With a constant minus seven Celsius wind blowing in from Ireland, this layer of blubber is a necessity. Two things the casual visitor will wonder upon seeing this mass of flesh, firstly why the country doesn't tip up during the summer, and secondly how many of them can even walk. For those who believe they are overweight, a visit here is like an instant diet. Blackpool should be visited by everybody at least once in their life. After visiting, leave it ten years, then visit again, just to see how little it has changed. It is a phenomenon that watches fads come and go, but avoids them all. Highly recommended!